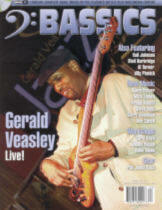 Bass Guitar Magazine, issue 17, 2005 "Multi Strings"
Publishers insight into Garry Goodman's bass playing. Interview with Garry Goodman in Bass Inside Online Magazine. Article discussing Garry's technique Percussive Harmonics and the C#00 string. General description of Garry's musical endeavors. Full page ad for the Basson B510SC cabinet, made to accommodate the Adler 11 String Bass. This is an International Magazine.